Happy Sunday! Today I’m trying out a new-to-me brand called Superficially Colorful. 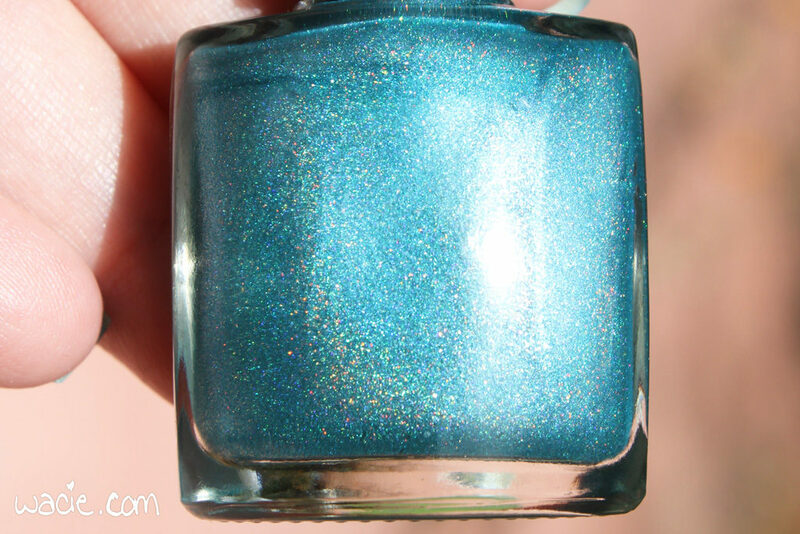 This polish, Breathe, is another entry in the Lighthouse of Hope box curated by Blue-Eyed Girl Lacquer. This is a charity box that benefits the depression awareness and education network I Need a Lighthouse. For this swatch, I’m wearing three coats of Breathe with one coat of Seche Vite. All photos were taken in direct sunlight. Breathe is matte-drying aqua linear holo. Application was good; the product consistency was spot-on, and I had no issues using it. The first coat was nearly opaque and everything evened out by the second. The polish does dry matte, so top coat is necessary for shine. Some matte holos don’t look fantastic because the holo flame just blends into the overall look, but that’s not true with this one. You could skip it if you’re a fan of the matte look. An aqua/turquoise holographic polish with a little silver and blue shimmer. I think it’s what we all need. To take a deep breath and go on. Everything is easier when you can breathe. I’ve written about the Lighthouse of Hope box a few times, and about some of the other polishes in the box. The box itself costs $80, and $60 of it is donated to I Need a Lighthouse. You get eight polishes from all your favorite indies and you give to charity, what’s not to love? The box is available from the Blue-Eyed Girl Lacquer shop, and though they’re currently on a break, do get this box when they get back. Other Superficially Colorful polishes are available from their website.